At FADE IN:, we don’t believe that creativity has levels, and so, all levels are welcome. We guide you to make creative writing part of your life, where you can start and finish your projects and keep producing more and more creative work. To express yourself creatively is important, and it’s needed for every part of your life. What’s a good age to start writing stories? Now! Right now is a good age. 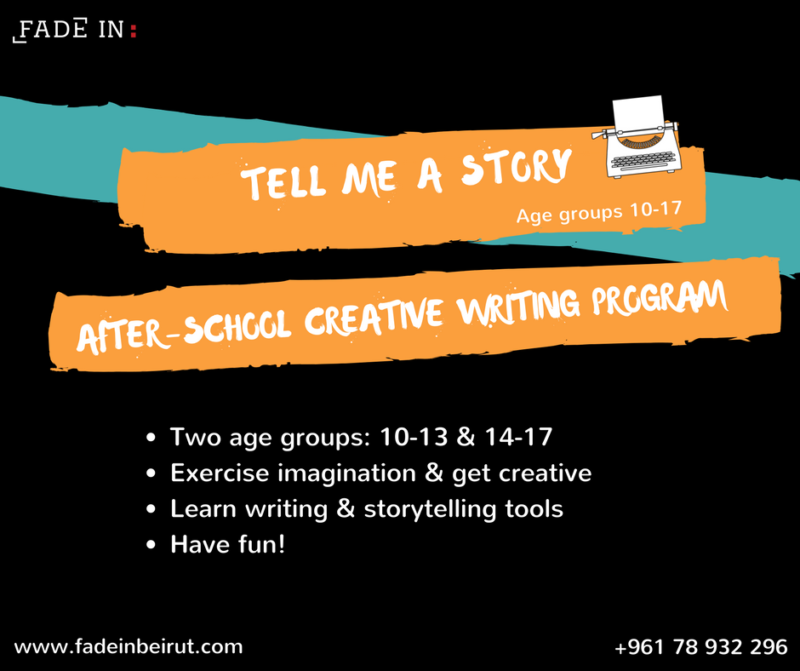 Tell me a story is an after-school creative writing workshop for your creative thinking and writing skills. Our goal is to encourage youth ages 8-11 and ages 12-16 to stay explore their own creative process, be able to express themselves confidently and find their voice in storytelling (and in life). This is NOT a dry grammar class; this is NOT school. At FADE IN: we have FUN! In an interactive, creative space everyone will have the freedom to create their characters and the world they live in. We will practice writing exercises and storytelling tools; we will build characters, figure out plots, and create imaginary worlds! All ages will be encouraged to be writing every day. If you have a cool story to tell, this workshop is for YOU! Tell Me A Story is open to young writers between the ages of 12 and 16. Group sizes are limited to 12 children to allow for plenty of interaction and the opportunity to workshop ideas. • Be challenged to grow and build self-confidence as writers/storytellers. • Exercise creativity and imagination – they are muscles too! • Participate in a range of activities designed to inspire creativity and foster writing skills and self-expression. • Meet and share writing talent (and ideas) with lots of new friends. • Develop the essential skills of creative writing in a fun and supportive environment. A Lebanese writer, musician, and the Community/Student Liaison at FADE IN: Creative Academy. She holds a BA in English Literature from LAU and has considerable experience training in public speaking and conflict resolution in the LAU Model United Nations Program. She was awarded for Best Senior Project for the Academic Year 2014-2015 for an extended work of creative adaptation incorporating music, set, and poetry. Since the beginning of her creative writing journey with extensive training at FADE IN: she has implemented her newly found voice to her online poetry blog. She continues to grow her writing portfolio with several projects including songs and short stories. She’s worked in journalism, copywriting/editing and even administration and management. When she is not running a Youth-centered workshop at FADE IN: you can find Youmna, on a high dose of caffeine, composing a lovely melody, or scribbling a fun rhyme. One day, she hopes to work with special needs children and adults to teach them how to better express themselves through the art of Story.